"knowledge is valid only if it is shared by All"
Hi guys, DPM 2012 SP1 rollup 2 is available. Before you install this update, make a backup of the DPM database. You may have to restart your DPM server after you install this rollup package. Before you begin installation, make sure that features .NET Framework 4.0 and .NET Framework 3.5 are installed. Launch your SQL 2012 SP1 DVD or ISO. # Server Configuration: It's a sandbox, so for SQL accounts, I will use the same domain account for each role. Don't forget to add your account or your group to be SQL server administrators. Launch your DPM 2012 SP1 DVD or ISO. When you want to use DPM 2012 local SQL instance, you most likely let DPM to install SQL Server 2008 R2 from the System Center 2012 DVD and host the DPM database on this instance. Nethertheless you can use an existing local instance of SQL 2012 Server on the computer that you are installing DPM. 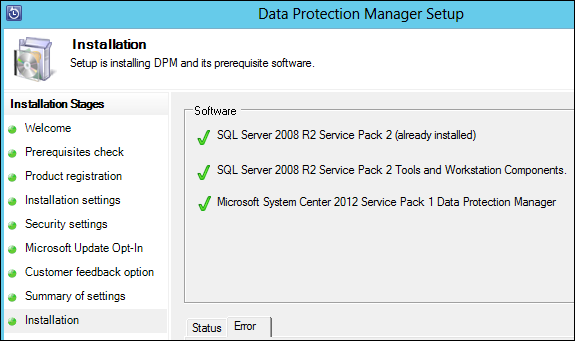 In this post I will show you how to install DPM 2012 SP1 (On W2K8R2 OS) using local SQL 2012 SP1 instance. Not really, because if you try to install SQL2K8R2 SP2, wizard will tell you that your SQL components are already upgraded. 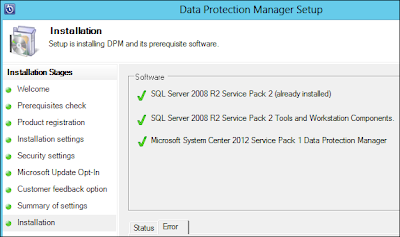 When you install/update your DPM 2012 protection agent from pre SP1 or SP1 to SP1 RU1 through DPM console it's fairly easy. You just have to click on Update available in Management/Agent tab and the job is done. Sometimes (Firewall, incompatible version, etc.) DPM agent cannot be updated from DPM console and you need to proceed manually. Cd /d "U:\Program Files\Microsoft System Center 2012\DPM\DPM\ProtectionAgents\RA\4.1.3313.0\amd64"
Cd /d "U:\Program Files\Microsoft System Center 2012\DPM\DPM\agents\RA\4.1.3322.0\amd64\1033"
:: in case of new installation, just remember to attach your new protected server to your DPM Server. 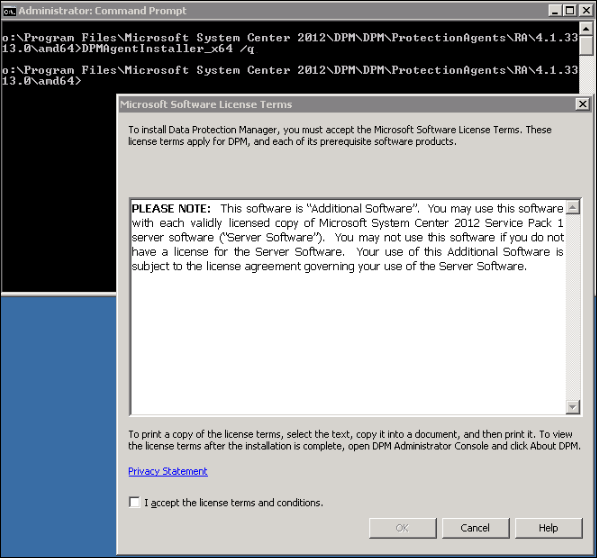 Install the rollup package on the server that is running System Center 2012 SP1 - Data Protection Manager. To do this, run Microsoft Update on the server. In the DPM Administrator Console, update the protection agents. Caution: You may have to restart your DPM server after you install this rollup package. I made a few tests in sandbox to upgrade various version of DPM 2012 + QFEx hosting on W2008R2 before to go to production. If QFE3 is already installed, then you can go to upgrade to SP1 RTM. So take your time and plan rigorously (Mainly on large DPM environment) your DPM 2012 SP1 upgrade to avoid too long production's outage. # Launch DPM 2012 SP1 Volume ISO/DVD, notice that "Service pack 1" is indicated on the Left bottom corner. Choose Install / Data Protection Manager. # Accept the License terms, click Next on Welcome page. # Prerequisites Check: For this upgrade, I use the decicated instance of SQL server, Click on Check and Install, then Next. # Review and click Next on Product registration, Installation settings, Security settings, Microsoft Update Opt-In and Customer feedback option. # Installation is finished : Data Protection Manager has been successfully upgraded. Click Close to close the DPM wizard. # Upgrade protection agent by clicking on Update Available. Notice that you may need to make a consistency check after the upgrade is complete. # When Agent upgrade is done, select your Protection Group where replicas is inconsistent and then perform a Concistency Check. Remember that Concistency Check could be time-consuming, click Yes. # Verify that all your Protection Group are in green state. # Congratulation :) DPM 2012 SP1 Upgrade is done. Je travaille en tant que consultant IAM - Identity and Access Management - au sein de la société SYNETIS. Ce blog a juste pour ambition de partager mon expérience, le contenu est proposé tel quel, sans aucune garantie de résultat. OpenBaar : Ruud Baar’s SkyDrive.